The Forum will bring together the international project partners of the Wasteland Twinning Network from Europe, Asia, USA and Australia. 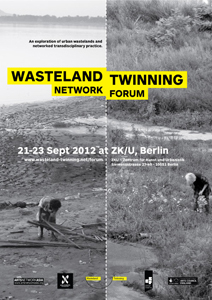 Hosted at the Zentrum für Kunst und Urbanistik, the Forum will feature presentations, guest speakers, critical debates, Twinning Ceremonies, wasteland interventions and workshops. Rebecca Beinart, David Bell, Mathew Trivett (Wasteland Twinning Nottingham UK), Sonal Jain (Desire Machine Collective IN), Lena Obergfell (Sydney AU), Ansgar Reul (W139 NL), Ferdiansyah Thajib (KUNCI Cultural Studies Center ID), Saubin Yap (Rumah Air Panas Art Society MY). Benjamin Brace (UK), Tore Dobberstein (Complizen DE), Sofia Dona (GR), Mathew Gandy (UK), Annette Maechtel (DE), Stef Richter and Romy Richter (Burghard DE), Klaus Overmeyer, Skulpturenpark Berlin_Zentrum (DE), Jan van Duppen (NL).